To what extent could the weakness in February be a payback for the outsized growth in December and January. The three month average for nonfarm growth in Wisconsin looks solid. Also, do you have any thoughts on the average hourly earnings data? Looks like Wisconsin is seeing strong growth over the last year. Well, I’m not impressed with the evolution of hourly earnings (I don’t have much to say on the idea of payback). Figure 1 shows CPI deflated average hourly earnings for production and nonsupervisory workers in Wisconsin as compared to the Nation. 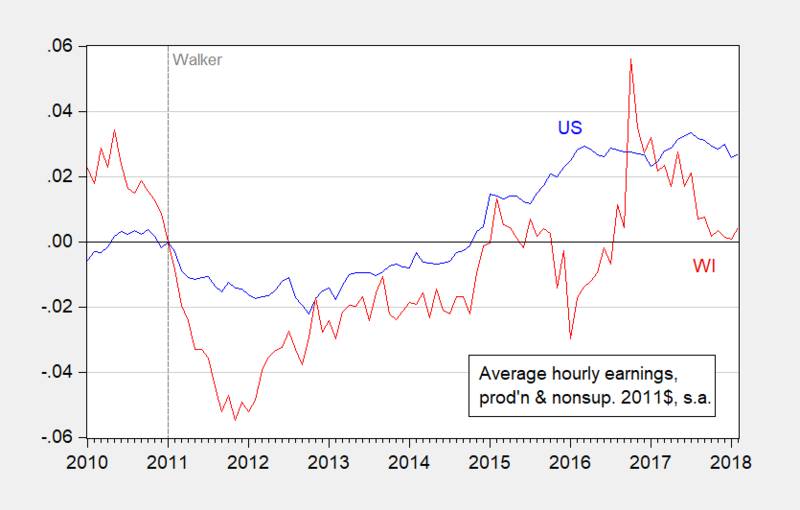 Figure 1: Log average hourly earnings for production and nonsupervisory workers for US (blue), and for Wisconsin (red), both deflated by CPI-all, 2011M01=0. Source: BLS, and author’s calculations. 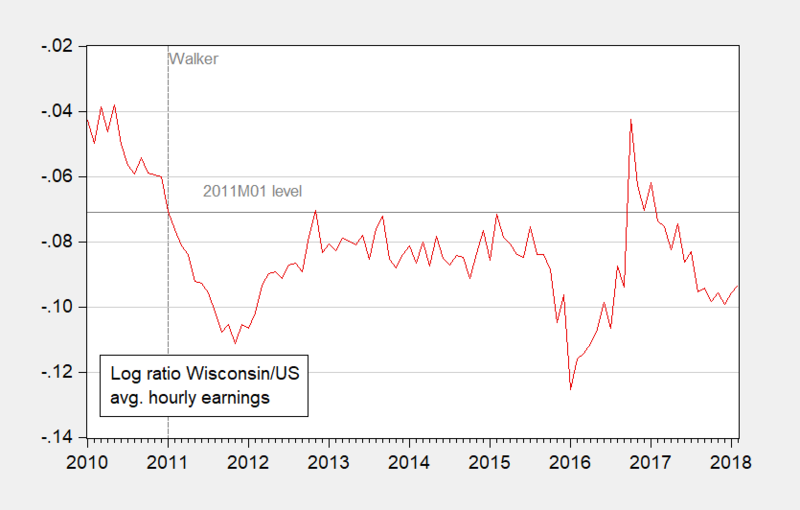 Wisconsin wages are only 0.4 percent higher (log terms) than they were in January 2011. In contrast, for the Nation as a whole, they were 2.7 percent higher (log terms. Figure 2 shows the log ratio of Wisconsin to US average hourly earnings. Figure 1: Log ratio of average hourly earnings for production and nonsupervisory workers for Wisconsin to US (dark red). Horizontal gray line at value for 2011M01. Source: BLS, and author’s calculations. This entry was posted on March 28, 2018 by Menzie Chinn. Average hourly earnings for all private employees in Wisconsin ran $25.6 in February 2018: https://fred.stlouisfed.org/series/SMU55000000500000003SA That is up 6.2% against last year and taking out 2% inflation implies real hourly earnings growth of 4%. Neil: Yes, that’s the series including supervisory and management employees. I’ve plotted the series that correspond to FRED series AHETPI at the national level.